Women are fearless when it comes to changing the game and trying new things. Their level of tenacity is only matched by their level of passion, and throughout it all, they maintain a solid sense of humour. A strong woman can motivate the rest to push on and emerge as a voice of change. Woman make the world go round and it’s now time them to stand up and be counted for. Don’t just change the game, change the world! Behind every strong woman is a strong woman is a strong wardrobe. An essential piece in any wardrobe is Port Authority’s Ladies Long Sleeve Silk Touch Polo. Our uber stylish, timeless classic Ladies Long Sleeve Silk Touch Polo can be worn tucked in or tucked out of a skirt or pants. Go from professional business woman to cool chick in the matter of seconds. The versatility doesn’t end there. This top is perfect for all sports, whatever the conditions, polo, horse riding, tennis, golf, cheerleading and even skiing. The long sleeve suits any body type and every skin tone making it an ideal uniform for businesses/organisations and schools/colleges alike. The colour range for the Port Authority’s Ladies Long Sleeve Silk Touch Polo covers all the core colour groups, its provided in; Black, Burgundy, Dark Green, Navy, Red, Royal and White. This range really shows the versatility of the long sleeve polo, whereas the Royal colour has been really popular with businesses, the Burgundy has proved to be popular with the more fashion minded ladies. Our Silk Touch Polo is soft, supple and easy to care for. The silky smooth pique knit resists wrinkles. The super light 5 ounce weight, the soft 65/35 mixture poly/cotton pique, the stylish flat knit collar and cuffs, same colour matching buttons, double-needle armhole seams and hem finished with side vents which make this top comfortable in any climate. The classic long sleeve style looks great any woman, no matter the size as there is such a variety. Adult sizes go from XS, S, M, L, XL, 2XL, 3XL, and 4XL. Are you a strong, independent lady looking to change the game? Don’t have the right wardrobe to so? 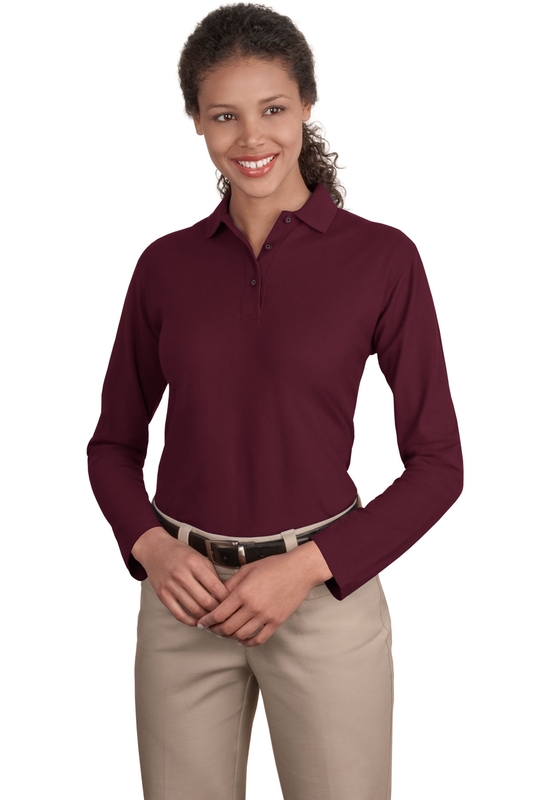 Look no further, Port Authority’s Ladies Long Sleeve Silk Touch Polo is the top for you. Stand up, stand up in style.